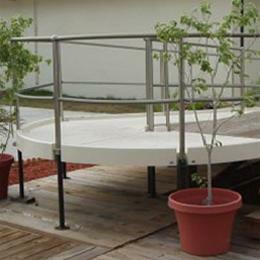 Add a ramp is the first modular wheelchair ramp that adds beauty to a home. The ramp is maintenance free, ADA compliant and portable for easy relocation to another site. Attention to designÂ and detailsÂ are what make Add-a-Ramp special. The ramp sections are offered in three colors and the mesh fabric handrail inserts are offered in four colors. All hues were selected to work with popular commercial building finishes.